Although the company first began with a focus on the residential industry, they pivoted to the commercial realm and continued to infuse a residential feel to each product they design to this day. 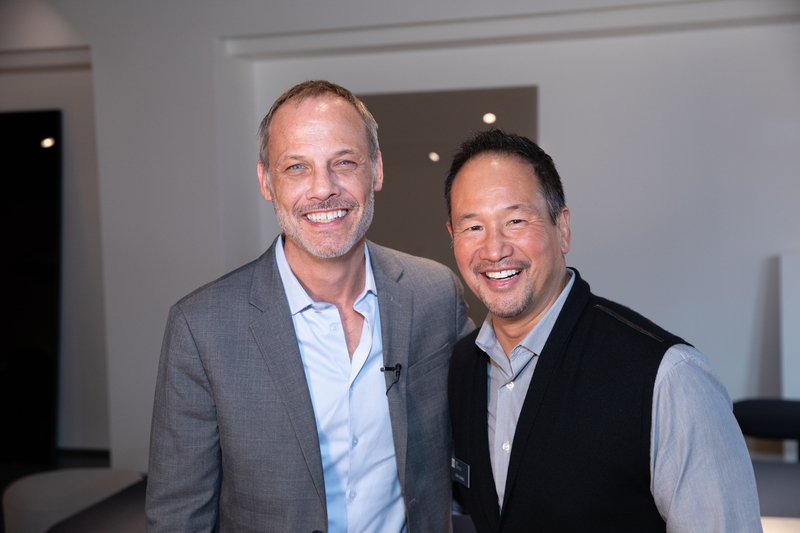 After browsing their booth at 2018 NeoCon in Chicago, our trade show partner and acclaimed designer, Christopher Grubb, personally interviewed the President of HBF, Dan Chong. Dan's passion for the company, the product, and the design was striking, and we couldn’t wait to bring you a snapshot of the conversation. Here are some of the highlights from the exclusive interview between Dan and Christopher. What you’ll notice about HBF’s broad product line today is its contemporary and modern edge which is so versatile that it works in both residential and commercial settings. This past year, there’s one common theme at almost every design show and expo House Tipster’s been to: health and wellness. One aspect of health and wellness that many designers and manufacturers focus on is the link between color and workplace efficiency. Dan noted that there’s no “one-size-fits-all” way to design an office environment, but that color is extremely helpful in helping to stimulate certain behaviors. “When the light is softer in a room, it just feels quieter. But when you amp up the space with brighter colors and natural sunlight, it adds energy and promotes collaboration,” he stated. HBF has truly aced the whole dual color vibe to meet the various needs of people working in commercial settings. “It’s colorful and sophisticated,” Christopher emphasized. “As I walk through the showroom, the Kinzie Screen stands out, “ Christopher said to Dan about one of HBF’s most popular products. This modular and beautiful particular privacy screen is the perfect addition to give employees personal workspace or to create defined spaces. He pointed out the blend of natural wood and industrial look that provides a very chic, modern appearance. In fact, HBF won an award for the product! Speaking of modularity, that feature is one of HBF’s main priorities when designing commercial furniture. For example, their newest sectional modular sofa, designed with the modern office in mind, features a classic tuxedo design with a modern twist that appears residential but is meant for commercial spaces. Again, the key here is the residential look mixed with a commercial appeal. Above all, we were dazzled by HBF’s array of gorgeous office furniture, which is all American made in Hickory, North Carolina. If you’re eager to check out what HBF has to offer for your commercial space, you can view their products on the HBF website.